If you want the fun of a dirt bike, but on the road then a trail bike is definitely the bike for you! A dual purpose bike, trail bikes are built specifically for on and off-road motor biking. 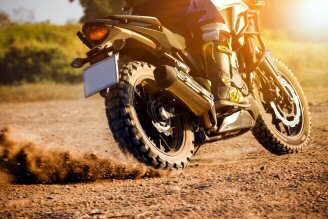 Whilst they are made to look like a dirt bike, they have all of the required specifications that will allow you to ride legally on the road such as mirrors, lights, registration plates and a speedometer. You will also need to tax and MOT a trail bike! In recent years the world has gone dotty for superbikes, leaving trail bikes quite literally trailing in their wake. But the trail bike is making a big comeback with Honda launching its new CRF250L. Just like the Honda XL250, it has all the visual aspects of a motocross bike, but is more intended for recreational use rather than for competing. The CRF250L is lightweight and slim and offers an excellent ride along those winding country lanes but is at its full potential as a commuter bike and is perfect for new riders. Backed by a leading panel of insurers MotorCycle Direct are able to offer online quotes for the majority of on-road motorcycle categories. So if you own or are looking to purchase one of the below bikes for example and would like to get an online quote, click on our Get a Quote button. Alternatively, if you would prefer to speak to one of our team please contact us where one of our helpful insurance representatives will be happy to discuss all of your options with you, to see if we can find the right insurance for you.